It is difficult to keep up with Graham Baynes who again set off on his bike to raise vital funds to help children in Darfur. 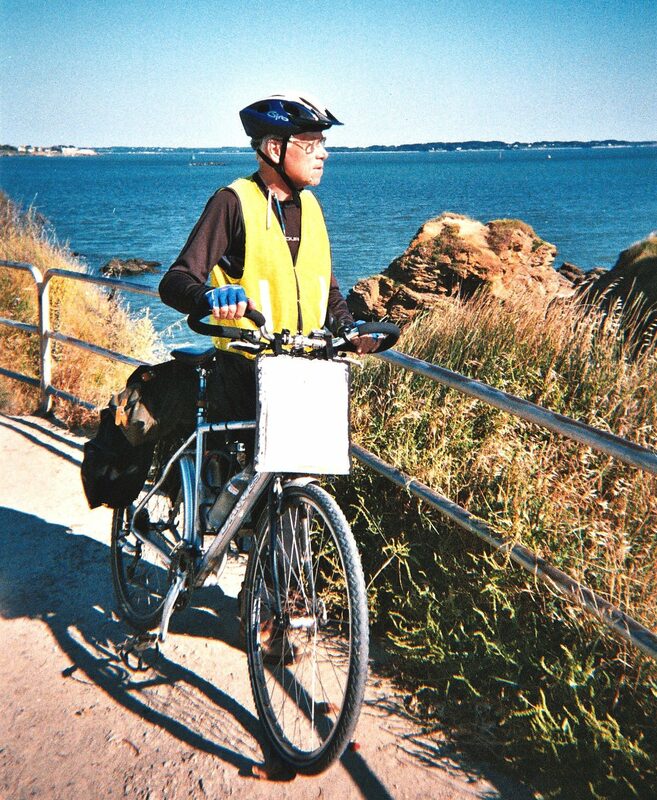 At over 80, you would think that he might well be taking life a little easier, but no, in the heat of summer this indefatigable Wareham resident set out to cycle 300 miles across the country, taking in some of this country’s most challenging terrain. We cannot thank Graham enough for taking on this challenge – he has raised an incredible £1,160 so far! An amazing amount which will be put to so much good use in helping families in Darfur. Starting in Kendal, Cumbria, Graham’s circular route took a week. This year, Graham’s family decided they would not be left behind and joined in the ride. They were spotted along the way, but what an achievement! You can read all about the journey here. Huge congratulations and thanks to Graham and his family. Daughter Hilary reports: Day One, 8 people set out from Kendal on bicycles, but only two made it to the finishing point 58 miles later at Drigg. No need to guess who was one of the remaining two: Graham with his son in law John. The boiling hot weather made the others see sense, with two going back to Kendal and the rest retiring to an air-conditioned car at various intervals during the day. Some of the cyclists had been lulled into a false sense of security, traversing a wide but flat valley, only to find themselves walking up steep hills the other side (worth it though when there was a long hill to free-wheel down the other side). The main riders were all family with three generations involved. The support team (which included Graham’s wife Nancy) did a sterling job providing top ups of water and home-made cake with the duty driver having a few fun and games getting used to driving an unfamiliar vehicle. At least she hasn’t hit anything…….yet! This is becoming a regular thing, following his 80th birthday present to himself (treating himself to a cycle from Dorset to Edinburgh and raising over £3,000!) Graham followed this up with an expedition to cycle 475-mile ride around Wales in 2015, and again last year. Below is the route and further updates from Graham over the 7 days. Day two: “Another hot day made easier with a gentle breeze coming off the Solway Firth and more favourable contours. Following mainly B roads and gentle cycle tracks we navigated through places like Whitehaven and Maryport, having stopped for a coffee and ‘photo op’ at The Pantry in Parton. The support team kept up our morale with timely arrivals at designated meeting points (home-made cake as well as water). A group of five set off on bikes this morning and, as we left Carlisle, Graham became excited about a kestrel hovering above an office block. What he hadn’t noticed was the kite strings from the pigeon scarer! The group of five soon reduced to two after 12.5 miles. The sight of steep long hills was enough to cause the wimping out as well as the promise of a visit to Vindolanda along Hadrian’s Wall. The support team enjoyed their own detours. Not sure if the maps weren’t accurate or the Sat Nav in the passenger seat wasn’t working properly, but they saw parts of the countryside they didn’t plan to visit. They ended up worrying cows, the bull worried them and the locals looked on. After 68 miles the team arrived in Simonburn for a welcome supper of Northumberland sausage and mash, followed by planning for the next day and hoping that the weather forecast of rain was an aberration. So, today started with rain which the die-hards got on with. They got some company further along the journey with the fair weather crew joining in. The terrain was mixed with roads, cycle paths following the River Tyne, paths following the coast and muddy paths through woods and over farmland. A picnic lunch was enjoyed in Newcastle prior to catching the ferry across the river from South Shields.We played dodge the doggy poo and glass in the less salubrious areas and enjoyed the view in others. The headwind was a little challenging in places. We also played dodge the horse poo (difficult on narrow paths) and were grateful to be so far from home as we are sure that Graham would have found some way to transport it back to the garden. After 71 miles (the support team having met the cyclists at regular intervals) we were delighted to arrive in Durham.The welcoming committee had already unloaded all of the luggage and took our bikes from us to lock them up. We wonder what delights will meet us tomorrow. Four in the car and four on bikes and a couple of nasty hills to cycle up (or for some walk) as we left Durham. We soon joined a pathway following a disused railway line although Graham thinks it was for a funicular train. Hilary tried to leave a mudguard on a lamp-post but we decided to take it with us.Two then took early retirement after 12 miles whilst Graham and son in law, John, carried on. Designation – traffic free section. Explanation – 1-foot wide muddy path with lush brambles reaching shoulder height. Shirt sleeves and trousers necessary. At the Bowes Museum the family flaked out in the sunshine whilst Graham and John flogged up a hill at 1732 feet. John likes hills, Graham conserves energy so John reached a point where he waited 20 minutes for Graham so had a quick nap. The road down from the summit had nasty bends with one long straight stretch and a race with a baby rabbit. Where cycle track directions are hidden by the under-growth, and the half-mile route on an unmade track (with stiff gates) leads to a farmyard, one can understand the busy farmer’s irritation at having to say ‘all sorts of cyclists come up here.’ Our apologies were accepted with a smile. The hostel at Kirby Stephen (a converted Methodist church) was spartan and improved by grandson, Callum, cooking the supper with help from his sister Elsa and aunts, Catherine and Hilary. Nancy and Helen did the washing up.The kitchen utensils had seen better days and gave the appearance of having been purchased from the local charity shop. 58 miles achieved by the cyclists whilst today’s duty navigator and driver achieved their journey without any interesting detours. John needed to catch the 12.45 train from Oxenholme back to Crewe and was intent on keeping to schedule. With a change in the weather to strong wind and rain, he did not want to get cold while waiting for others (i.e. me). The next time we caught up with him was on seeing his bike outside a coffee shop in Sedbergh. By then, I was soaked. The choice had been either to wear a jacket which drained onto my trousers, or a cape which could have caused me to be blown backwards. I chose the former, which gave those in the (air conditioned) backup car the opportunity to dispense jeers, as well as sustenance, over the next dozen miles. Coffee over, John was not seen again until the car deposited Catherine at their home in Crewe. Meanwhile, Helen’s conscience dictated that she should accompany her father to the finishing post. This she did, and both got lost when signposts ran out. We drew stumps when the day’s mileage was reached, not far short of Kirkby Lonsdale, and near the top of a memorably long hill. Then, with bikes mounted on the car, we started the journey home, with a tea-break and a good-bye to Catherine at Crewe, and reached home at 23.30 (by which time my clothes were dry).